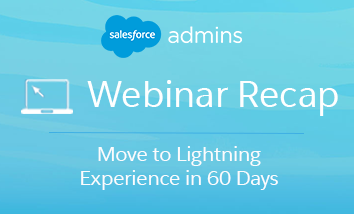 Our recent Admin webinar: Move to Lightning Experience in 60 days was all about showing #AwesomeAdmin Trailblazers tried and true steps that would allow them to successfully move their orgs to Lightning Experience. Nana Gregg and Marshall King of JLL involved their users in the design and configuration of Lightning while encouraging initial and ongoing adoption in order to successfully transition users to Lightning Experience in just 60 days! Why did they want to migrate in the first place? First and foremost, Nana and Marshall wanted to take advantage of Lightning-only features. Features that would improve their users’ experience and efficiency within the Salesforce platform. With Lightning-enabled, they were also able to give users an enhanced dashboard experience, and tailor other views based on users’ job role and personas. And, to answer the question about, “why do it in 60 days?” Nana and Marshall felt that using a rapid, agile approach would allow them to be more responsive to their users’ requirements and feedback, as well as minimize excess training and change management. 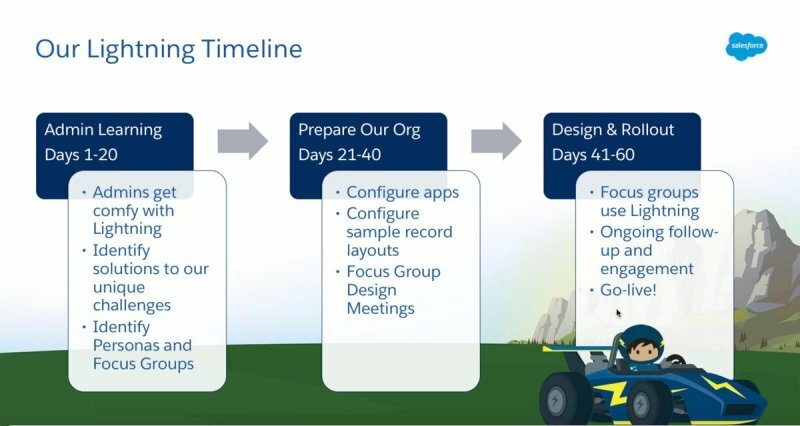 Nana and Marshall’s 60 day Lightning migration timeline was based on three main phases: Admin Learning (days 1-20), Preparing Our Org (days 21-40), and Design and Rollout (days 41-60). From there, they broke down these phases into manageable, bite-sized chunks. They explained that this was the most efficient way to do it because they needed time to identify challenges, figure out their plan, use Trailhead resources, and have a deadline to actively work towards. Then, you’ll want to examine highly-used apps. Test your AppExchange apps and categorize them into three buckets: Lightning-ready, Lightning-friendly, and what’s Lightning? 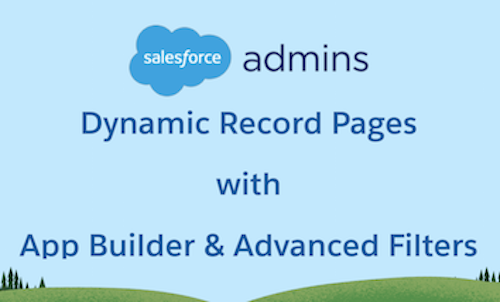 From there, you can define your Lightning apps and configure your record pages accordingly. Defining personas and persona representatives means finding out who your key users are, and how they will experience Lightning. Select the “super-users” and Salesforce champions, as well as a few nay-sayers, Marshall explains. You definitely want to represent different opinions as you design. From there, defining personas is all about identifying what their primary uses for Salesforce are. 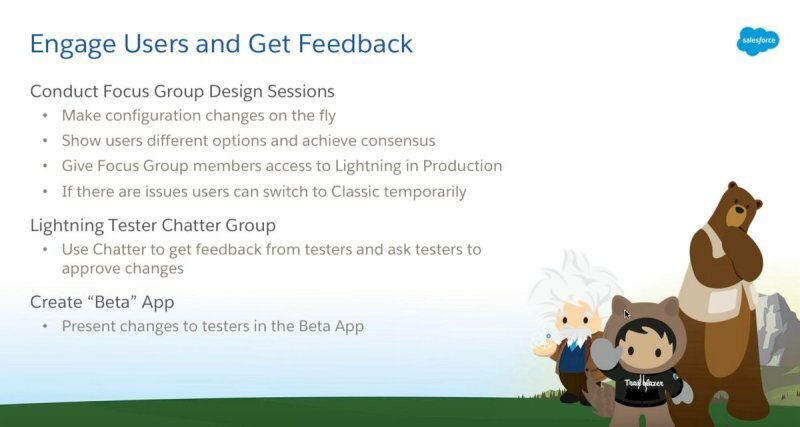 Focus groups and design sessions are powerhouse tools when it comes to creating and launching a successful Lightning migration. They give you the ability to make changes on the fly, achieve consensus through collaboration, and allow temporary access to Classic to address issues in real-time. Plus, things like Chatter groups and beta apps feel collaborative–giving users a space to test things out and offer their input before any change is solidified. The beta app is accessed via permission set and Nana shared that “when people requested changes, we would configure the Lightning record page how they requested it and then we would broadcast & ask for feedback before activating it in the actual app in question” It was a very successful tool! 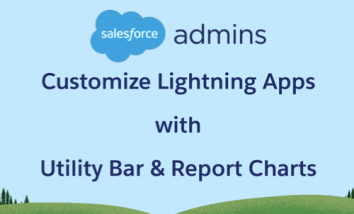 Start by installing the Lightning Adoption Tracker from the AppExchange! 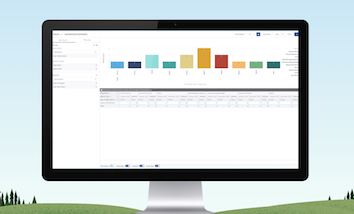 Configure it by your profiles and personas and then make it your homepage dashboard for all Admins. This is an invaluable tool for adoption and success. Also, schedule training sessions and make sure you’re thinking about engaging users who may not be based at HQ. Either travel and bring the training to them, or record a session and share it out. Get ready to go live! Nana recommends giving all of your users access to Lightning. But! Here’s the catch—before you do, send them a preparatory email that outlines what is going to happen when they log in next, and what their next steps are immediately following that log-in. That way you have no surprises. You’ll definitely want to mention when the next training is, and what you’ll be addressing. Be ready for feedback from your users, and encourage them to share their questions and concerns in a separate Chatter group. Lastly, begin using that Adoption Tracker app! Nana and Marshall are continuing to incorporate Lightning features by rolling out custom theming with myLightning in Spring ’18. They host weekly office hours to help users and answer questions. Working with beta and regular users allows them to continue trying to improve the experience. And finally, they have started the process of disabling Classic profile by profile, starting with Chatter-only users because they will feel the least impact, and moving on from there. Want to know more about the specifics of JLL’s move to Lightning? 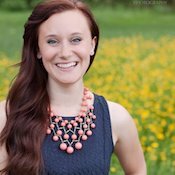 Read Nana’s blog post. Get the slides and other related resources on the webinar landing page.